At VingDirect, we exist to help family wineries achieve their direct to consumer goals. Whether your focus is to grow sales and wine club members, to train and educate your staff, to polish up your brand, or to take a look at your overall DTC business, we can help. We take time to learn about your business, evaluate where you are, execute a plan to help you meet your goals, and maintain a working relationship to see you grow. Currently, VingDirect has 55 winery members and we work with hundreds of winery clients across the US. Our family winery members receive personalized, on demand consulting, ongoing education and training, 24-hour access to the wine industry’s largest DTC webinar library, and access to our VingPortal Tasting Room Performance Tracker (PT) and Benchmarking Tracker. 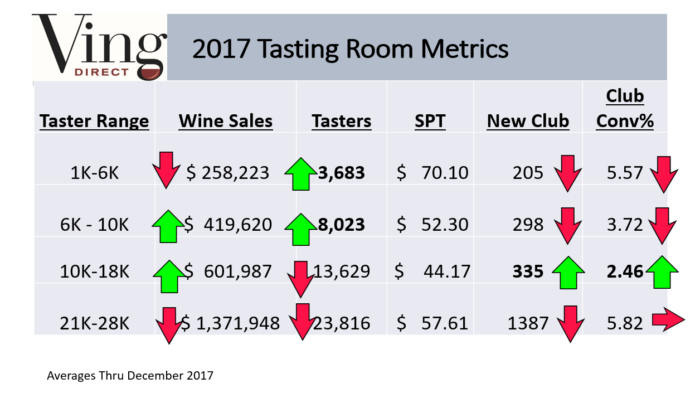 The Performance Tracker (PT) tracks 5 key performance indicators, including Tasting Room Sales, Taster Count, Sales Per Taster, New Wine Club Members and Wine Club Conversion. (Metrics are driven by taster count. If you’re not currently tracking tasters, that’s the one thing to start doing today! Knowing your annual taster count drives everything else in your business.) Our Benchmarking Tracker allows our winery members learn how they’re doing in relation to their peers in the industry. We Know the Story Behind the Numbers! Through findings from our Performance Tracker and Benchmarking tool, we see 2017 trends and are forecasting for growth in 2018. What’s unique about our study is that we know the winery story behind the data so we can recommend best practices, tips and tactics. Aggregated data represents wine regions across the United States including California, Oregon, Texas and Washington from 2016-2017. Wineries who see between 2K-28K annual tasters. 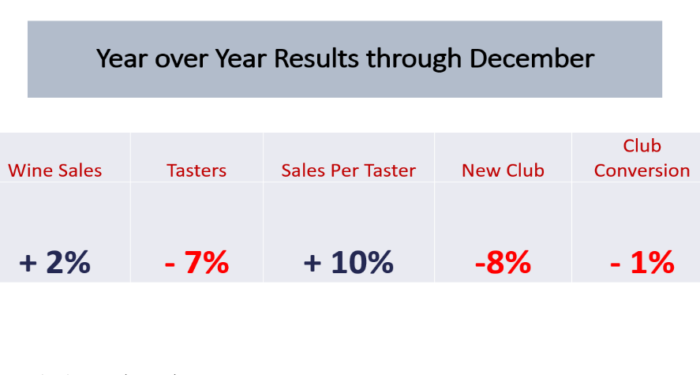 For full year 2017, we find that wine sales and sales per taster were up while tasters, new club sign ups, and club conversion were down for 2017. 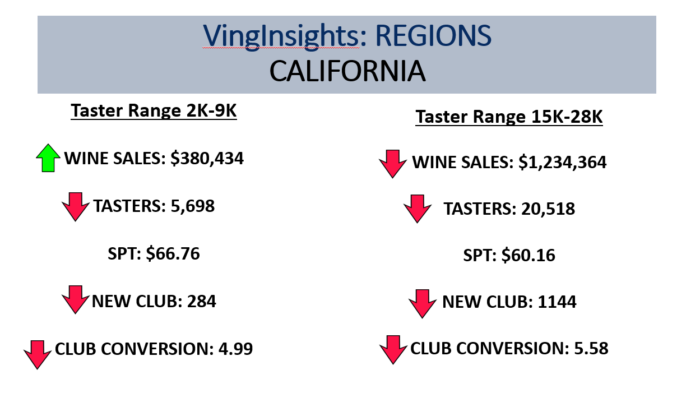 One of our "ah-ha's" is that wineries seeing 10-18K tasters did see an increase in new club members (new sign ups only) and in club conversion. Also significant is that wineries receiving between 21K-28K tasters saw declines in all metrics year over year. Oregon and Washington wineries are located in high traffic regions, so they tend to see a greater number of tasters which can pose challenges. If the tasting room is full it can be harder for the team to make a connection to convert a guest to a club member. As a result, WA and OR have lower than average club conversion rates as compared to the industry average. 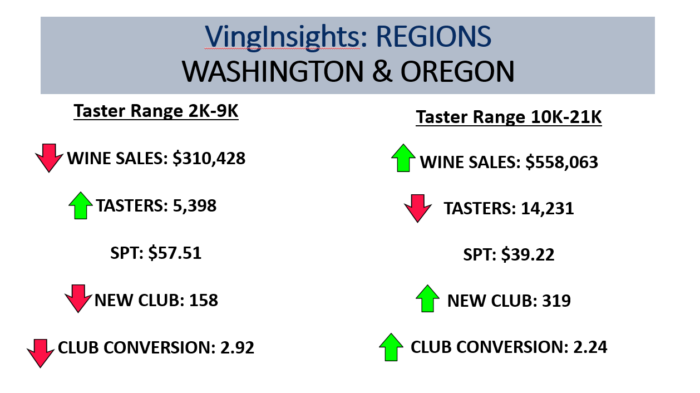 WA and OR wineries seeing 10K-21K tasters saw great growth in 2017! California had a rougher year in 2017. We started seeing these trends in 2016, especially in the Napa region, then creeping into Sonoma. We'll say again, though, there are always exceptions and some of our newer members saw significant gains in 2017! The Sonoma/Napa fires had minimal impact in October, and didn't greatly impact the overall results. If processes (training) are in place for seated experiences you can expect higher sales per taster and conversion rate. If you do not have processes in place and treat these experiences the same as you would a bar tasting, sales per taster and conversion rate can decline. Train your team on best practices for seated tastings! Right offer, Right channel, Right audience! You must differentiate to thrive!